Because I went on a trip by myself that included about 8 hours of flying, I got a lot of reading done. I didn't do as much reading at the hotel as I had planned, but I still got through one full book: Cold Light by Jenn Ashworth. I also wrote the review for that one so you can click the title to read it. I've also made it most of the way through Leaves by Michael Baron. My son is reading the fourth book in the Septimus Heap series by Angie Sage and Mark Zug: Queste. He's about halfway done with it. He also requested a book on the lost colony, which he's learning about at school, so we got The Lost Colony of Roanoke: Opposing Viewpoints by Tom Schouweiler from the library. I'm still reading Leaves by Michael Baron and Election! by Dan Gutman. 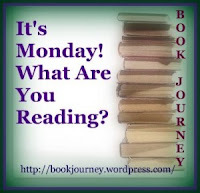 Next up will be The Secret Life of Cee Cee Wilkes by Diane Chamberlain, my October book club selection. A trip by yourself??? 8 hours' plan ride to read?? A hotel room (I'm assuming to yourself)?? I'm so jealous! I have had one or the other kid home sick/recovering from surgery for a full month now, and I am dying for just an hour to myself. I hope you enjoyed it! Sounds like some interesting books in your house this week - I just posted about some Halloween reads in our house!